Welcome to my first giveaway! I'm so excited to team up with my friend Sara to do this giveaway. Sara and I went to college together, she moved back East and we randomly reconnected through the blogosphere - isn't it great how that happens?! You can check out Sara's blog here. She approached me about doing a giveaway and I was thrilled to find out it would be a Stella & Dot product. I've been admiring their jewelry since discovering it a little over a year ago and I am so excited to share a piece with one of my readers. 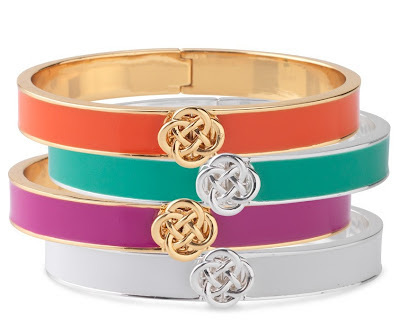 Enter the Lindsay Bangles - a simple, yet luxurious enamel bangle perfect flying solo or mingling in any arm party. To enter the giveaway please leave a comment with the color bangle you'd choose and an e-mail address to contact you in case you win. For bonus entries, follow TheRightShoes via GFC or Bloglovin', and another for following me on Twitter. *Please leave a separate comment for each. The giveaway is open to US residents only and will be open until Tuesday June 5th, 11:59pm PST. I'm also hosting a virtual Stella & Dot trunk show for the next couple of weeks - if you're interested in more S&D pieces click here to shop away! Loving The Right Shoes? Follow me on Twitter and Bloglovin'! Love the turquoise bracelet! Classic Tiffany's style! Ooh how exciting! I bet that you can guess which one I'm in love with--the orange/gold! These are very pretty & so classic. I also just followed you on bloglovin'! I like the pink. thanks for the giveaway. i am a follower on gfc. I love the turquoise bangle! Gosh! Those are so cute all together! But if I had to pick just one, I would pick the orange and gold! Of course, I follow you on twitter @Siho8984 :) Good giveaway! I would choose the purple one! I'd choose the orange! love it! So cute! I adore the Coral/Orange one :) Thanks! I like the orange/coral one! I adore the pink bracelet. It'll spice up my wardrobe. Thanks for sharing. Following you in Bloglovin from Courtney.e.perkins07@gmail.com :) love the coral color! I love all of these...I'd either choose the orange or turquoise! Such a hard choice!! Love the orange one the most! Unless otherwise stated, all images and content on this blog belong to Tracy Davis. I do my best to properly credit the work of others so if you see something that is credited incorrectly, please let me know! You may share the content and images on this site, but please link back to my blog.